Jodie Taylor scored in the 89th minute on an assist from Megan Rapinoe as Seattle Reign FC beat Portland Thorns FC 1-0 in the second Cascadia clash of the season. For the first time ever, the Reign lead the Cascadia all-time series — they are now 8-7-3 all-time vs. the Thorns. The win moves Seattle back into second-place in the NWSL with a 6-3-5 record. Their 23 points are 13 points behind first-place North Carolina, though Seattle does have one game in hand. The Thorns dropped to 5-5-5 with 20 points and into fifth place. Thorns goalkeeper Adrianna Franch made eight saves on the night, several spectacular, but could do nothing about Taylor’s game-winner. Rapinoe dribbled to the end line, going once again 1v1 with Thorns defender Ellie Carpenter as they had for much of the night. Rapinoe sent a low pas into the center of the box, finding Taylor open to tap it in for the game-winning goal. Just two minutes earlier, Franch made a leaping grab when Rapinoe — as she did earlier this season in Seattle — tried to send a chip to the upper-right hand corner. Franch had a read on it the whole way, and snagged it out of the air, catching it with both hands and not giving up a rebound. Franch wasn’t the only member of the Thorns coming up with huge stops. Defender Katherine Reynolds made a leaping block as Taylor tried a scissor kick in the box in the 80th minute. In her first start of the season, Thorns forward Hayley Raso had three strong opportunities to give Portland a go-ahead goal earlier in the match. Her closest effort came in the 62nd minute. Thorns midfielder Lindsey Horan collected the ball on a throw in, then turned and crossed it perfectly to the head of a wide-open Raso in the box, but her shot went just over the crossbar. Franch also came up with big saves in the first half. In the 39th minute, she made a point-blank kick save on Beverly Yanez in the box. As well as a save on Rapinoe in the 18th minute, with Taylor lurking in front of her for a rebound. The Thorns nearly got on the scoreboard in the 44th minute when Ana-Maria Crnogorčević headed home a Meghan Klingenberg corner kick, but was ruled offside. Rapinoe led both sides with six total shots, two of which were on goal. She also recorded three chances created, according to Opta. The Reign defense was largely able to limit the touches of Horan and Christine Sinclair, who were so dangerous vs. Sky Blue FC on Wednesday night. Neither were able to get a shot on target, but Horan finished with three chances created. Sinclair had one. The Thorns were held without a shot on goal. The Reign took 18 total shots to the Thorns’ 10, as well as besting them in shots on goal 9-0. Seattle also had the better of possession, 58.6% to 41.4%. Lauren Barnes returned to the starting line-up, after missing the last two games with a concussion, and registered six interceptions. She also became the second player in NWSL history to pass the 10,000 regular season minutes mark. Midge Purce earned her first minutes for the Thorns since spraining her ankle earlier this month at U.S. women’s national team training camp. The Thorns were without Tobin Heath (right ankle injury) and Emily Menges (hip pain). The game was rather physical, with the Reign conceding 12 fouls and the Thorns six. Both sides earned a yellow card. The Thorns will next be in action on Friday at home vs. Utah Royals FC. The Reign will welcome the Dash to town on Saturday night. Match ends, Seattle Reign 1, Portland Thorns 0. Second Half ends, Seattle Reign 1, Portland Thorns 0. Offside, Seattle Reign. Allie Long tries a through ball, but Alyssa Kleiner is caught offside. Goal! Seattle Reign 1, Portland Thorns 0. Jodie Taylor (Seattle Reign) right footed shot from very close range to the centre of the goal. Assisted by Megan Rapinoe. Substitution, Seattle Reign. Jasmyne Spencer replaces Elizabeth Addo. Attempt saved. Megan Rapinoe (Seattle Reign) right footed shot from outside the box is saved in the top right corner. Assisted by Stephanie Catley. Attempt missed. Ana Maria Crnogorcevic (Portland Thorns) right footed shot from a difficult angle on the right is close, but misses to the right. Assisted by Lindsey Horan with a headed pass. Attempt missed. Ana Maria Crnogorcevic (Portland Thorns) header from the centre of the box is too high. Assisted by Meghan Klingenberg with a cross. Attempt missed. 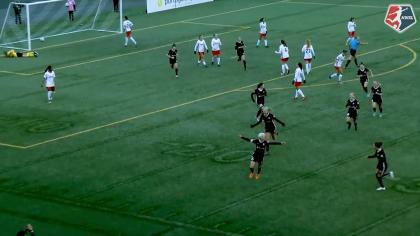 Lauren Barnes (Seattle Reign) left footed shot from outside the box misses to the right following a corner. Attempt blocked. Theresa Nielsen (Seattle Reign) right footed shot from outside the box is blocked. Assisted by Megan Rapinoe. Corner, Seattle Reign. Conceded by Katherine Reynolds. Attempt blocked. Jodie Taylor (Seattle Reign) right footed shot from the centre of the box is blocked. Attempt missed. Megan Rapinoe (Seattle Reign) left footed shot from the left side of the box is too high. Assisted by Elizabeth Addo. Attempt missed. Midge Purce (Portland Thorns) right footed shot from long range on the left misses to the right. Attempt saved. Rumi Utsugi (Seattle Reign) left footed shot from outside the box is saved in the top centre of the goal. Assisted by Megan Rapinoe with a cross. Corner, Seattle Reign. Conceded by Meghan Klingenberg. Attempt missed. 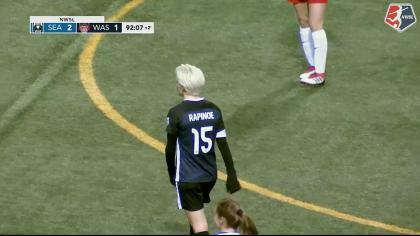 Megan Rapinoe (Seattle Reign) left footed shot from the left side of the box misses to the right. Assisted by Megan Oyster. Substitution, Portland Thorns. Midge Purce replaces Andressinha because of an injury. Delay in match Andressinha (Portland Thorns) because of an injury. Attempt missed. Hayley Raso (Portland Thorns) header from very close range is too high. Assisted by Lindsey Horan with a cross. Corner, Seattle Reign. Conceded by Celeste Boureille. Andressinha (Portland Thorns) wins a free kick in the attacking half. Attempt saved. Elizabeth Addo (Seattle Reign) right footed shot from the centre of the box is saved in the centre of the goal. Assisted by Stephanie Catley with a cross. Attempt missed. Ana Maria Crnogorcevic (Portland Thorns) right footed shot from the centre of the box misses to the left. Delay in match Stephanie Catley (Seattle Reign) because of an injury. Attempt saved. Allie Long (Seattle Reign) right footed shot from the centre of the box is saved in the centre of the goal. Assisted by Lauren Barnes. Attempt missed. Hayley Raso (Portland Thorns) right footed shot from the centre of the box is too high. Assisted by Lindsey Horan with a headed pass. Second Half begins Seattle Reign 0, Portland Thorns 0. First Half ends, Seattle Reign 0, Portland Thorns 0. Attempt missed. Elizabeth Addo (Seattle Reign) header from the centre of the box is close, but misses to the left. Assisted by Lauren Barnes following a set piece situation. Attempt saved. Beverly Yanez (Seattle Reign) header from the centre of the box is saved in the centre of the goal. Assisted by Theresa Nielsen with a cross. Attempt missed. Lindsey Horan (Portland Thorns) header from the centre of the box misses to the left. Assisted by Meghan Klingenberg with a cross following a set piece situation. Lauren Barnes (Seattle Reign) is shown the yellow card for a bad foul. Attempt missed. Lindsey Horan (Portland Thorns) header from the centre of the box is too high. Assisted by Christine Sinclair with a cross. Attempt saved. Beverly Yanez (Seattle Reign) right footed shot from the left side of the box is saved in the centre of the goal. Assisted by Jodie Taylor. Attempt missed. Hayley Raso (Portland Thorns) header from very close range is close, but misses to the left. Assisted by Meghan Klingenberg with a cross following a fast break. Attempt missed. Megan Rapinoe (Seattle Reign) right footed shot from outside the box is too high. Assisted by Beverly Yanez. Attempt missed. Megan Rapinoe (Seattle Reign) left footed shot from the left side of the box is too high. Assisted by Beverly Yanez. Attempt saved. Megan Rapinoe (Seattle Reign) right footed shot from outside the box is saved in the bottom left corner. Assisted by Elizabeth Addo. Meghan Klingenberg (Portland Thorns) is shown the yellow card for a bad foul. Delay in match Allie Long (Seattle Reign) because of an injury. Attempt missed. Jodie Taylor (Seattle Reign) left footed shot from the centre of the box misses to the left. Assisted by Theresa Nielsen with a cross. Attempt saved. Beverly Yanez (Seattle Reign) header from the centre of the box is saved in the top centre of the goal. Assisted by Theresa Nielsen with a cross. Offside, Seattle Reign. Lauren Barnes tries a through ball, but Megan Rapinoe is caught offside.